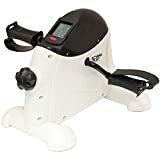 Mini exercise bikes, also known as pedal exercisers, are a great way to exercise from the home or office, allowing people who are short on time to keep active. 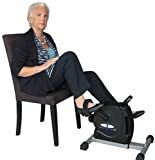 These pedal exercisers are also great for rehabilitation after surgery or any injuries. In addition, users with arthritis will benefit from the non-weight bearing movement. Furthermore, a number of these models can be used for arms or legs adding extra diversity to your workouts and building up your strength. 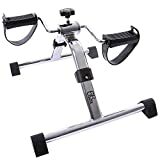 After reviewing other UltraSport equipment, it is no surprise this model is our top pick pedal exerciser. Equipped with a 2kg flywheel, this unit ensures a smooth cycling motion that can be used to work your arms or legs. The resistance can be altered via the dial on the front of the unit. Bear in mind that these bikes aren’t designed to compete with the resistance you would get with a full-sized bike. Nonetheless, the resistance is perfect for someone looking for an extra bit of movement to regain some muscle strength. A large LCD display tracks the distance, time, total rotations and estimates the calories burned. Although, this model costs slightly more than some others, UltraSport has included a 2-year warranty. In second place we have the DeskCycle 2 which is an upgrade on their previously popular model. 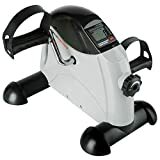 The biggest difference between this model and its competition is that is uses a patented magnetic mechanism which can also be found in the “MagneTrainer”. As a result, this model is far quieter than the friction resistance system we often see on mini pedal exercisers. In addition, it can generate far more resistance than other models with a total of 8 different resistance levels to choose from. The LCD display comes with a desk extension kit. This allows users to have the display on top of the desk. Therefore, you will be able to easily track the speed, time, distance and calories without looking under the desk. The only downside with this model is that it does cost more than most other units. However, it does come with a one-year warranty for extra peace of mind. With a foldable design the 66fit exerciser is a great choice for users that need a portable model. In addition, it weighs under 3kg making easy to take with you on the go. The resistance can be altered by turning the knob located on top of the unit. While the resistance is light, it does help get blood flowing around you legs and is great for users with arthritis as there is very little pressure on your joints. All in all, this is a nice model with an aesthetically pleasing chrome finish. However, it does not have a display in which case the NRS M37352 might be a better option for you. This model uses an electric motor to help move the pedals. You may think this sounds a bit odd for exercise equipment, however it is very useful for a rehabilitation and to improve blood flow. The built-in digital display tracks the time, number of revolutions and calories burned. In addition, the display can be removed and used as a remote control. This makes life a lot easier for users with limited mobility that may not be able to bend over alter the settings. Display shows time, calories burned, cycle and revs for per minute. The M37352 is very similar to the 66fit model we saw earlier but comes with an LCD display. The on-board computer tracks the time, calories, cycles and revs per minute. However, the display is small and can difficult to see when it is on the ground. The main selling point of this model is the foldable lightweight design. Consequently, it is great for users that want to take it back and forth between work. As this is designed as a source of non-weight bearing exercise the resistance is light. However, the resistance can still be altered via the knob located on the front of the unit. Those on a tighter budget will like the price of the NRS at just over £20. Although the MagneTrainer is the largest model in our guide, it is the most stable. The extra wide base allows you to make the most of the extra resistance from its patented magnetic system. In addition, the magnetic resistance is very quiet but does make this model quite heavy weighing 9.5kg. While this model does cost a lot at about £150, it is built to a commercial standard with high quality components. While the Mirafit exerciser might look very similar to our winning model, there are a few differences. With a 25% lighter flywheel, this model doesn’t produce as smooth a cycling motion. In addition, while the display does track the same metrics such as time, rpm, distance, calories and has a scan function it is harder to see. Furthermore, this model is only about £5 cheaper once you have paid for delivery. You also don’t get the great customer service and warranty offered with the UltraSport version.